Two-factor authentication is an additional security process to secure your account by the combination of a password and a mobile device. This reduces the chance of your account being hacked into and protects your data with extra secure measures. Step 3: The user provides the secure code in the browser, to access the account. The user can choose to remember the code in the particular browser in the system, for the next 45 days. If the user accesses the system from a different browser or a system, the user needs to provide a new code again to access the same account. Step 1: User generates a unique Application Specific Password for each external application used. Step 2: During the configuration of Zoho account in the application, provide the 16 digit Application Specific Password, instead of the regular password. Step 3: Upon successful validation, you will be able to access your account. Application Specific Passwords never expire and hence you need not update the password in the application, even if your web password expires. You can revoke an application specific password from TFA settings, to prohibit/ ban access for the particular application. When a user resets the password, the user can choose to revoke auth tokens, which will also revoke the application specific passwords. Zoho Mail provides Zoho Mail and Inbox Insight for both iOS and Android devices for accessing Zoho Mail with its full set of features from smartphones. This does not require any application-specific password to log in. You just need to provide the Secure code to login to the app. Step 1: User logs in with Username and Password. Step 2: User gets a secure code via SMS/ Voice call or QR Code app linked with the account during set up. The user can choose to remember the code in the particular browser in the system, for the next 45 days. If the user accesses the system from a different browser or a different system, the user needs to provide the code again. As a security measure, you can mandate the Two Factor Authentication (TFA) for the organization. All users must use the additional security code to login to their accounts. Hence make sure that each user has access to a mobile device to get the secure code via SMS/ Voice call or the mobile app with QR code scan option. Select the option 'On' to enable and enforce Two Factor authentication for all users in the organization. Once you enable TFA, the users will choose the TFA Mode (SMS using a mobile number or QR Code scanning), to set up their preferred Two Factor Authentication method, the next time they log in. You can turn off the TFA, to disable TFA for the entire organization. For information on the mode of TFA, refer this help page. However, the user needs to disable TFA again, if the TFA has been configured already for the account. The administrator can reset the TFA for users, in case they lost the mobile device or do not have access to the mobile device they used at the time of TFA activation. Select Reset TFA for the user, whose TFA process you need to reset. The next time the user logs in, the user can set up TFA from the beginning, providing a new mobile number/ Google Authenticator. The administrator can enable or disable the TFA status for users from the Control Panel. Select 'Enable' or 'Disable' to enable/disable the Two Factor Authentication for the user. The users need to generate and use application specific password when accessing the email account via POP/ IMAP or Active Sync if Two Factor Authentication is enabled for the account. 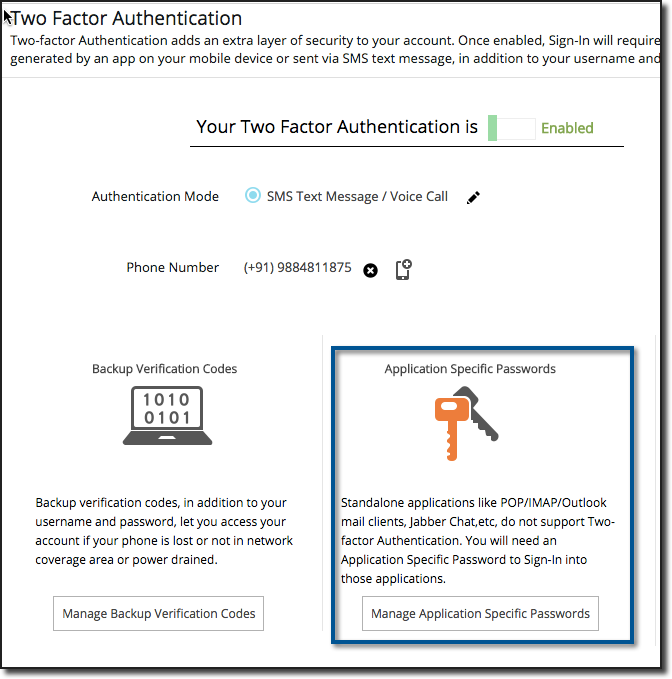 Select Two Factor Authentication >> Manage Application specific passwords. Provide the device name and your current web login password in the page. The device name is just a reference name, for you to verify/ revoke in future. Select 'Generate' to view the application specific password. The device specific password will be displayed only once and will not be displayed again. You need to use the password without any spaces in the device. You can select Show generated passwords to link to view the past generated time and device names. You can revoke any password if you no longer use the device or to remove access to the application.